Help your patients relax with MR Theater in a 71cm wide bore, and deliver whisper quiet procedures with Pianissimo™ and Pianissimo Zen. Pianissimo technology significantly reduces the noise in and around the MRI environment for every patient, every sequence, every time. And Pianissimo Zen quiet sequences further reduce noise to just above ambient noise level, making exams even more comfortable and easier to complete. The wide bore patient aperture and in-bore immersive virtual experience enhance patient comfort. 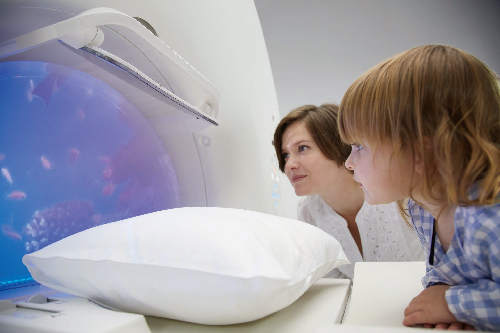 The MR theater encourages patients to relax and stay still, enabling clinicians to produce stable, high-quality imaging. Nyfikenhet och passion - det är vad som definierar Canon. För att läsa mer om vår teknik och lösningar som hjälper människor runt om i världen att förbättra sina liv klicka här. © Canon Medical Systems Europe B.V., 2019. Med ensamrätt. Informationen på denna webbplats är endast avsedd för hälso- och sjukvårdspersonal.